1. From the top of the ProQuest results page, you have the option to edit your search strategy through the Modify search link or you can make changes to your search in the search box. 2. Click Recent searches to view your search history. You can also view your search history by clicking on the Clock icon at the top of the main navigation bar. If you select any items during your search session, those Selected items will be stored in the Folder icon that is accessible from the main navigation bar (next to the Clock icon). Create alert sets up an email alert that you schedule and when new records are added to the database that match your search criteria, the records will be emailed to you. Create RSS feed sets up an RSS feed on the search strategy. Take the URL that is generated and put it into your RSS reader to begin pulling in records. Get search link generates a persistent/durable URL to the current search strategy. This link expires one year from the day you created the link. In addition to using these features from the Results page, they can also be used from the Selected items list and through the Folder icon. 4. Select items individually or select all items on the page. Click Selected items to view your selected records list. 5. Hover over the Source type icon for the source type of the document. For a list of all source types available in your results, see Source type in the Applied filters panel on the left side of the results page. 6. The Cite tool generates a bibliography. Copy and paste the generated bibliography into a document and make any necessary edits. Remember to always check for accuracy. You can also Email or Print any selected records. Save records to a bibliographic manager like RefWorks or New RefWorks (subscription and account required) or Save a copy of the record to one of the supported file formats. Save to My Research adds the records to your My Research account where they will be stored and available each time you sign in to the My Research account. To the left of the results page and records, you'll see the option to Sort and use Applied filters. 7. The Sort menu controls the sort order of the records that appear in the results page. Relevance is the default sort order, but your administrator can choose a different default order. Relevance is determined by an algorithm that factors in the number of time your search terms appear in the record as well as where in the record your search terms appear. Other possible sort options include oldest first and most recent first. 8. Use the Applied filters section to apply additional limits (also known as filters or facets) to refine your results. The limits are pulled from the list of available indexed/searchable fields that appear in the current result set. 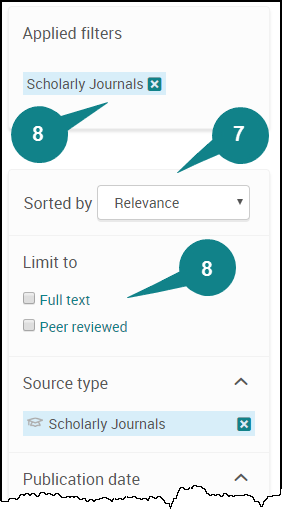 Some of the main limits you can expect to find (each search and database is different so you can expect different limits to display) include source, publication title, subject, language, and date. Please see the Searchable fields page of this guide to see a list of the common indexed/searchable fields. For a list of database specific searchable fields, please see the applicable database LibGuide. 9. At the bottom of the Results page, Other searches to try displays related and suggested subjects that you may consider searching on if you are dissatisfied with your current search results. The suggested subjects are related to your current keywords and pull directly from the subject field. 10. You will also find the page Navigation here and the Items per page option to choose how many results appear on the page. 11. Depending on your search, you may see suggestions to Books that match your search or Videos that match your search (especially if you have subscription content with Ebook Central or Academic Video Online (AVON). 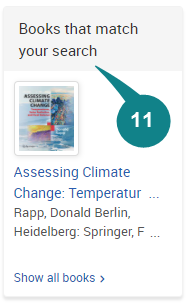 This panel will appear to the right-side of the results and will only appear if you have submitted a search that includes the Books and Audio & Video source types. If you used the filters to limit yourself to certain source types such as Scholarly Journals or Newspapers, then these suggestions will not appear. Whe you click on a suggested item, you will be taken to the document view and from there you can view the books or videos. For any Ebook Central and AVON content, you no longer have to leave your ProQuest session to view these items on their native interface. To learn more, please visit the document view page for Ebook Central Ebooks and AVON Videos. You can also view our latest training video on the updates to ebook and video content here.